Sabine's New Trick | welcome to the janniverse. When she’s not busy resting mid-day, she likes to munch on hay. We’ve had a habit of bringing new hay to her in the cardboard box in which you see her sitting in the photo above. The box moves around a lot. Sometimes it sits on the floor, and she drapes herself over it as she eagerly munches. Other times, we take the hay out of the box and put handfuls of it in front of her litterbox, which is in her house (you can see it in the foreground of the photo above). Although she’s a house rabbit, and has free rein, she does have a house she can retreat to when she wants. That box holds a lot of hay. Sabine likes hay best when it’s fresh out of the big box downstairs, where we keep it. (It smells more strongly of hay, which we suspect may be why — but one never knows, with bunnies.) So we usually give her big handfuls at a time, then frequently top up her hay supply whenever she’s eaten her way to the bottom. That way, she always has as much hay as she wants, and it’s always fresh and tasty. This also means we leave the hay-transport box sitting on top of the plastic boxes where we keep her litter. Sabine likes to climb up on our bed — especially at night, where we often have epic bunny snuggles. 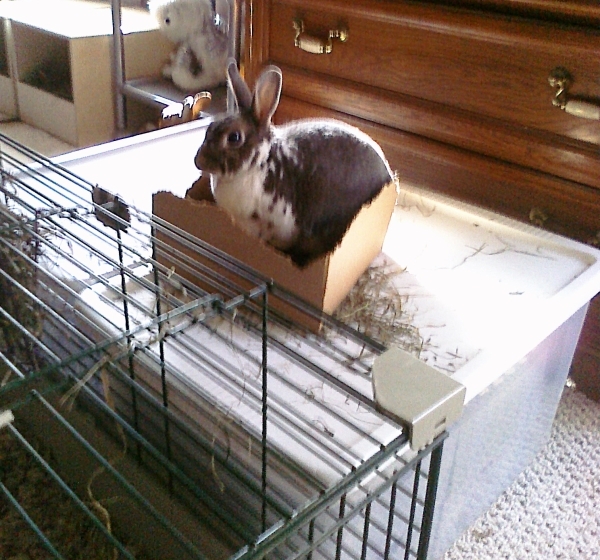 Sabine discovered a new trick last week: she now climbs on top of the boxes to get to the hay-transport box. And will sit in it, calmly eating. Sometimes she’ll simply sit up there, in mid-day egg posture, enjoying her new spot. Either way, she always looks so pleased with herself. It’s not very high off the ground, so we’re not worried about her hurting herself. When she jumps up and down off the bed, we’ve got a couple of carpeted cat pedestals that she uses to get up and down. These help protect her short little legs; although rabbits can (and do) jump very high, she’s a minirex, and has tinier feet and legs than most rabbits. I have 2 house bunnies atm, Molly who a big girl and is kind of fierce (badly treated before I adopted her), and Tallullah, aka Lou who is a quiet little Netherland Dwarf cross boy. They don’t do any tricks, but they make my life so happy. House rabbits are so wonderful. House rabbits are fantastic. Our other little girl (well, at the moment) is named Jutta, and like your Molly, we’re pretty sure she was badly treated before she ended up at the rescue where we adopted her. She’s coming around a bit, but she’s still very wary of humans. She loves car rides, though — I think she’s happiest when she’s curled up in a blanket in a canvas bag, on my lap, while my SO drives the car. I give her lots of nose scratches and ear rubs with my hands, and she just turns into a big puddle of happy bunny on my lap. 🙂 Only bunny we’ve had who actively LIKES car rides! Your guinea pig sounds awesome! All our rabbits have done stairs, but while I used to have guinea pigs when I was little, they never really had the opportunity.